IMPORTANT INFORMATION: OUR SMALL ONLINE SHOP IS TEMPORARILY CLOSED, NO POSTERS, POSTCARDS or CATALOGUES CAN BE ORDERED UNTIL THE NEW SHOP IS READY !!!! 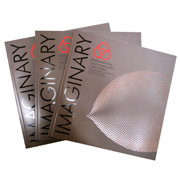 The IMAGINARY exhbition catalogue feautures all pictures and explanation boards of the exhibition in a 126 pages and 24 x 24 cm glossy booklet. It was designed by Boy Mueller. 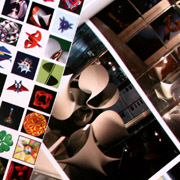 Each picture of the exhibition is shown on one page while the other page explains the mathematical backgrounds. 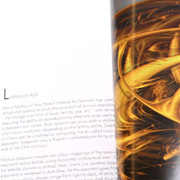 The catalogue is bilingual (German and English) and edited by Gert-Martin Greuel and Andreas Daniel Matt. 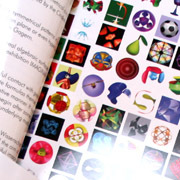 After the foreword the catalogue contains a report on the exhibition and experiences during the German year of Mathematics 2008. Then four chapters with pictures and a short introduction and biographies of the authors are presented. 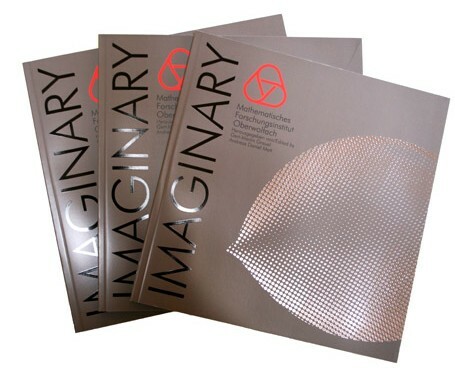 The catalogue is a perfect gift for Mathematics and Art Connoisseurs and for everybody interested in reading more about IMAGINARY! The shipping costs apply for up to 3 catalogues. If you would like to order more, please send us details in the "Other" field of the Order Form. We will then contact you regarding shipping or special conditions. The costs for the catalogue shall be paid in advance. Details regarding the bank transfer will be automatically sent to you after ordering. This will avoid misuse or automatic orders.